Lovely hostel. Hostel cat was fun during the day but woke us at night a few times. Staff were very helpful and always present. Location is fantastic with a great pub downstairs too! 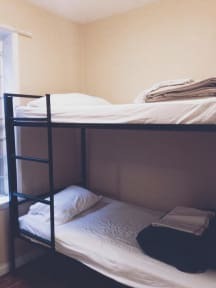 I stayed at the Cambie hostel over a weekend, I was pleasantly surprised by the hostel ! As for a hostel you need to expect some noise, but where our room was on the first floor, the noise from the downtown cars were worse than noise in the hostel,found it quite easy to fall asleep actually. The private room was a goos size! I enjoyed that the female washrooms were locked and the bathroom was always very clean. We loved the cat! He is so sweet and made our stay. Great location but not much activities that bring hostelers together. Would stay at their Gas town location next time. Its alright if you need a place to crash, you´ll survive, rooms seem pretty clean and safe (I stayed at a private room). Bathrooms are not made often during the day, room quite chilly during the night, and bathroom not that close. Outdoor street at night is quite noisy, couldnt feel an ambience. There are stairs and no lift. The place is just alright, not stylish/glamorous in any way. Excellent location in downtown Vancouver. Rooms are comfy but cold and quite noisy as there is only single pane glass on the windows and no radiators/heater (we asked and they didn't have any). Kitchen facility is well equipped and clean. The bathrooms sadly are less well maintained - they are definitely not cleaned daily and there were blocked toilets for several days of our stay. The bar downstairs is good and offers a pretty decent selection of beers and food. 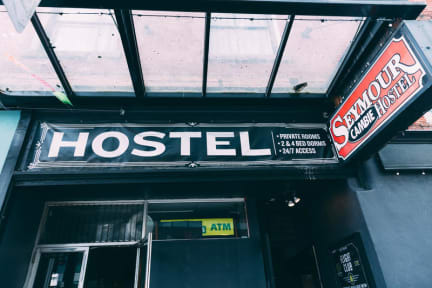 The location is great, but unfortunately, that’s all this hostel has going for it! The mattresses are completely worn down to the bed frame, there were minimal outlets for the room with more than half of them not working, and the bathrooms weren’t cleaned during my entire stay (5 days) and the garbage cans in the bathroom stalls were full from not being emptied for several days, if not weeks prior to my stay. The bathroom stalls were then completely out of order my last night due to overflowing. I stayed in the private room and unfortunately cannot say I enjoyed my stay. The cleanliness of my room was not great and neither was the bathroom. Unfortunately my stay was not great. The staff were all wonderful and processed a refund for my last night right away after checking out early due to finding bed bugs in my room. The first private room I stayed in was freezing cold even with a heater and the one outlet in the room died on the third night. I was moved to a second room where I immediately found bed bugs and took photos. The door to the hostel was kept open and random patrons from the bar were allowed to use our bathrooms. I would not stay here again, there was barely enough room to fit our luggage, the room was hot and stuffy. A staff member walked into our private room unannounced to “check how many stools were in there”, very weird and no one followed up after we made a complaint about this. Room was also right above the bar and we needed earplugs to even try and sleep. Not worth the money.